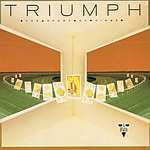 Review: "Triumph: The Sport of Kings (remaster)" - Sea of Tranquility - The Web Destination for Progressive Music! Canada's hard rockers continued their successive streak with 1986's The Sport of Kings, a commercial mix of hard rock guitar, progressive tinged pop, and radio friendly melodies. The remastering process has delivered a bright and crisp sound to this classy album, sending Rik Emmett's guitars & vocals, Gil Moore's drums & vocals, and Mike Levine's bass & keyboard work soaring to new heights. Noted mainly for the opening two tracks, "Tears in the Rain" and "Somebody's Out There", both of which were played quite a bit on FM radio at the time, The Sport of Kings has a strong arena rock feel throughout. "Tears in the Rain" is a crunchy rocker led by Emmett's power chords and Moore's powerful vocals, yet also has some cool melodic keyboards from Levine in addition to great vocal hooks. Speaking of hooks, "Somebody's Out There" has enough catchy melodies for the whole album, delivered in part by Emmett's soaring vocals. The band opts for some heavier rock on "What Rules My Heart", a song sung by Moore and featuring effective backing vocals from Emmett, as well as lethal electric guitar thunder and tender acoustic embellishments. Emmett delivers his passionate ballad on "If Only", an atmospheric pop rock song with symphonic keyboards and layers of guitar textures. "Hooked On You" sees a rare sharing of lead vocals from both Emmett and Moore, but is otherwise a bland & generic stab at radio or MTV hard rock, and easily the worst song on the album. On "Take a Stand" the trio pumps out a decent arena rocker with a big sounding chorus and thick, beefy guitars, bass, and drums, but they again fire out another clunker on the ballad "Just One Night", a drab piece that sees the boys trying to sound like Richard Marx or Bryan Adams. Thankfully, Mr. Emmett saves the day with his remarkable instrumental "Embrujo", a brief forray into Spanish and classical guitar themes that leaves you breathless for more. "Play With Fire" is a driving hard rocker fueled by Emmett's blistering leads and high-pitched vocal wailings, and the melodic "Don't Love Anybody Else But Me" is an underrated gem lost in the shuffle at the band end of the CD, littered with catchy hooks, tasty guitar work, and layers of keyboards. The album ends with the passionate "In the Middle of the Night", another radio friendly tune that also contains perhaps Emmett's most emotional vocals in the entire set. For many long-time Triumph fans, The Sport of Kings was a bit too commercial sounding, and it's obvious the band was reaching for greater chart, radio, and MTV acceptance. However, these guys could certainly write a catchy hook and combine that with some hard rock thunder, although there are perhaps too many instances of saccharine here. Still, it's a great remaster job, and you get full lyrics included.